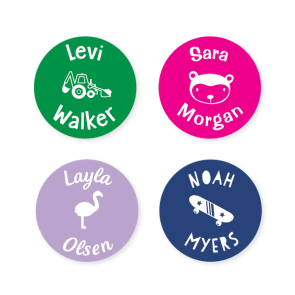 Our personalised name stickers will help your young one organise their toys and other belongings at daycare. 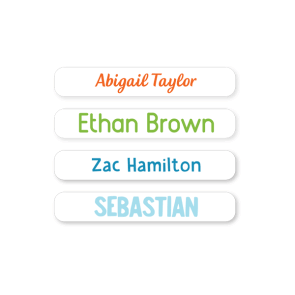 Stuck On You® Name Labels are safe in the microwave, dishwasher and freezer, plus they come with a scratch resistant coating making them waterproof and super long lasting. 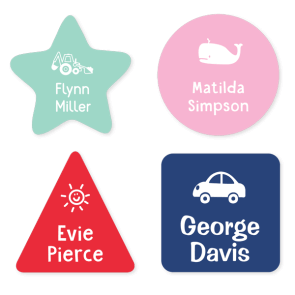 These quality stick on name labels will go the distance on plastic toys for 'show and tell' and playtime! Multi Use Labels are ideal for using on stuffed toys as it will not only give them more personality, it will ensure that these treasured companions make it home if they are misplaced. We recommend sewing down the Multi Use Label to their stuffed toy for added security. Pacifiers seem to go missing faster than you can buy them, but with our Multi Use Labels you can see them returning home safely! Our Mini Multi Use Labels can be used to wrap around the pacifier handle or ring using the flagging method so that it doesn't interfere with the pacifier's usage. 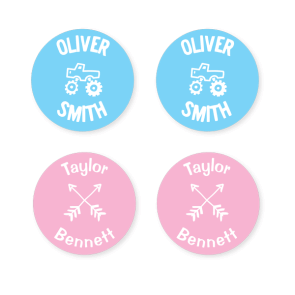 This same method can also be used to apply our Mini Name Labels to your child's pacifier, these are dishwasher safe so there will be no issues when it comes time to clean them! Thanks to their flexible woven material, Multi Use Labels are well designed to stick onto textured and dimpled surfaces. This makes them suitable to be stuck on a wide range of baby bottles and sippy cups with surfaces that can be difficult to label with other less versatile products. 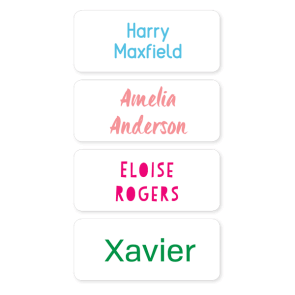 Multi Use Labels, as well as our Personalised Name Labels, are microwave, dishwasher and freezer safe to ensure their long-lasting durability on your little one's baby bottles. 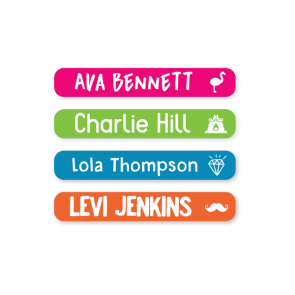 Bring awareness of your child's allergy to their teachers, carers, parents and friends with our gorgeous range of Personalised Allergy Name Labels. 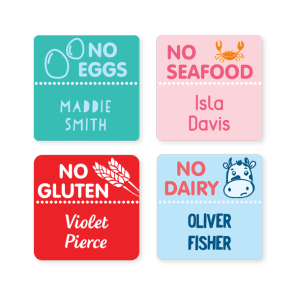 Our Allergy Labels cover a variety of different allergies including wheat, nut, dairy, eggs and seafood. These big, bold designs are a great way to remind other budding students at daycare to be careful of sharing and bringing food that may contain ingredients that their peers or your child are allergic to. 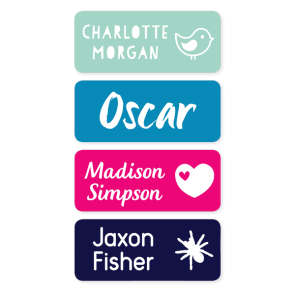 Thanks to their adhesive backing, our trusted Personalised Name Labels will stick strongly to your child's lunchbox, water bottle or food containers. 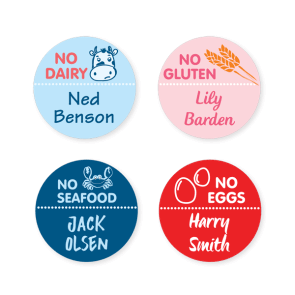 We recommend Classic Round Name Labels, as these are well sized to sit nicely on lids and are microwave and dishwasher safe. Labelling for daycare has been made even easier thanks to our trusted and versatile Multi Use Labels. Perfect for when you need to label your child's belongings for daycare in a hurry, Personalised Multi Use Labels can be stuck down to nap blankets and clothing as well as hard surfaces for a temporary labelling solution. To ensure a longer-lasting fabric label, we recommend sticking on garment care tags or ironing and sewing the label onto the garment. However, you can rest assured the label will stay put until you have time to iron or sew it on! Or you might prefer to use our Iron On Clothing Labels which are made from a flexible material that when ironed down creates a permanent transfer, embedding into the weave of the fabric. 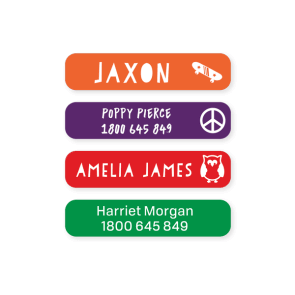 Personalised Book Labels are here to help make sure your child's first reading books make it back to your bookshelf! These are adhesive paper labels that are personalised with "This Book Belongs To" text to make it feel super special and keep it from getting lost in the abundance of books at their daycare centre. Use our super long-lasting Iron On Clothing Labels for an easily recognisable solution that will keep your child's little jumpers, shirts, socks and more out of the Lost Property box. 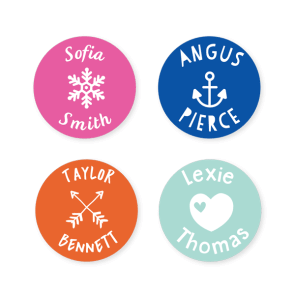 Help your little one find their shoes quickly and easily after nap-time with our bright Personalised Shoe Stickers. Complete with a scratch-resistant coating you don't need an extra clear overlay like some of our competitors, so they're easy to personalise, peel, stick and go! For the movers and shakers, aspiring athletes and dancers alike, make sure all shoes are labelled so they're spotted easily and don't end up in Lost and Found! Perfect for little feet, our Left and Right Shoe Labels are a great way to help your child learn their left from right (even if they can't quite read yet!). All of our value packs are here to save you both time and money when purchasing your next set of labels, and the 0-5 Preschool Pack will give your child the labels they need to keep their belongings organised at Daycare. The Preschool Pack includes a mixture of clothing and name labels to ensure that lost property is avoided from the beginning of your child's journey through school. 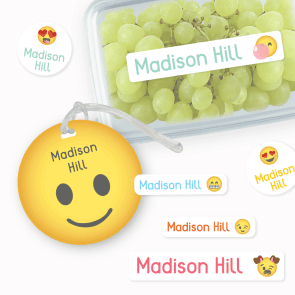 The Emoji Pack is another great value bundle that showcases our new collection of Emoji Labels. These cute little icons have taken the world by storm and your child will love seeing the hilarious faces printed next to their name on their belongings at daycare. Make the daycare drop-off that bit less stressful knowing that all your little one's favourite items will be safe and sound at kindergarten thanks to Stuck On You Daycare Labels. Great for labelling the essentials such as clothes, tubs, dummies and toys. Our Iron On Clothing Labels are easy to apply and stay stuck, while our sticky vinyl Name Labels are scratch resistant and waterproof! Choose from a huge range of design and colour options to match your child's style and find something you'll both love!